On Friday March 29, over 110 attendees paid tribute to the work of retired county Supervisor Hank Weston at our Rotary Club’s fourth Distinguished Citizen Dinner. 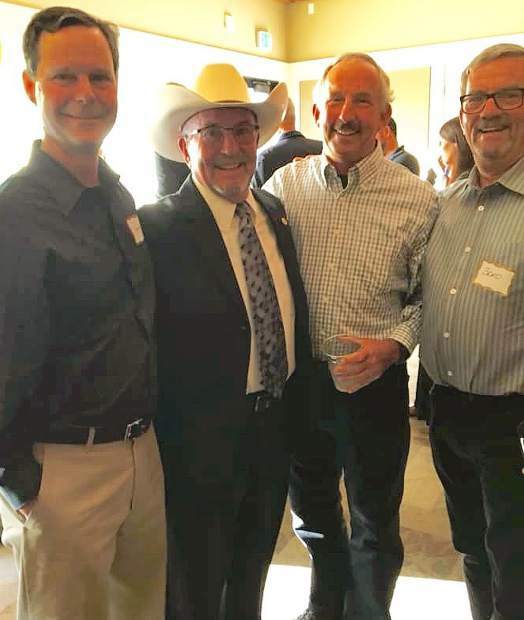 Held at Lake Wildwood’s Clubhouse, the event was a combination of community thanks to Hank for his years of service and an opportunity to raise funds for Rotary youth programs in our area. A wonderful video produced by Rotarian Larry Clark of Modesto, highlighted Hank’s 45 years in Fire Prevention throughout Northern California and his 12 years as District 4 supervisor. He was instrumental in securing funds to restore the Bridgeport Bridge. He also initiated the county’s first community Municipal Advisory Council for the Penn Valley area. This council gives community residents an opportunity for input on county land use issues. One of the highlights of the evening was when Hank discovered, to his surprise, that his three brothers, from outside the area, were in attendance. “This must have been the work of Kandy (his wife),” Hank exclaimed. Funds from this event will support the Penn Valley Rotary’s Eight Grade Leadership program at Ready Springs, programs aimed at improving communications among students, Rotary Youth Leadership Academy and Penn Valley Little League to name just a few. Special thanks to all those who attended, and contributed to making this a winning event.